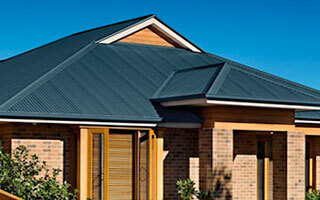 Colorbond roofing is increasingly popular among home-owners due to its sleek and stylish appearance. Whether you are constructing a new home or giving an existing home a modern makeover renovation, a new Colorbond roof will dramatically improve the appearance and add value. In addition to looking great, home owners are choosing Colorbond over tiles for its strength and durability. Gone are the days of replacing cracked and broken tiles which is costly and inconvenient - a steel roof is strong, long-lasting and low maintenance, designed specifically for the Australian climate. View the Colorbond features and benefits and colour range on our products page. Quikdeck is experienced in both modern and heritage styles. We have roofed homes of all sizes and profiles, both new and old. We have redesigned roof pitch and profile to flow with extensions and add-ons to achieve one seamless roof. Quikdeck is licensed with the Department of Fair Trading and insured for every project. We are members of the Master Builders Association of NSW and Metal Roofing and Cladding Association of Australia. Clients can feel confident that are dealing with a reputable and experienced company that only installs genuine Colorbond products.